The Gorham businessman and Republican nominee for governor said he would build on LePage's policies. 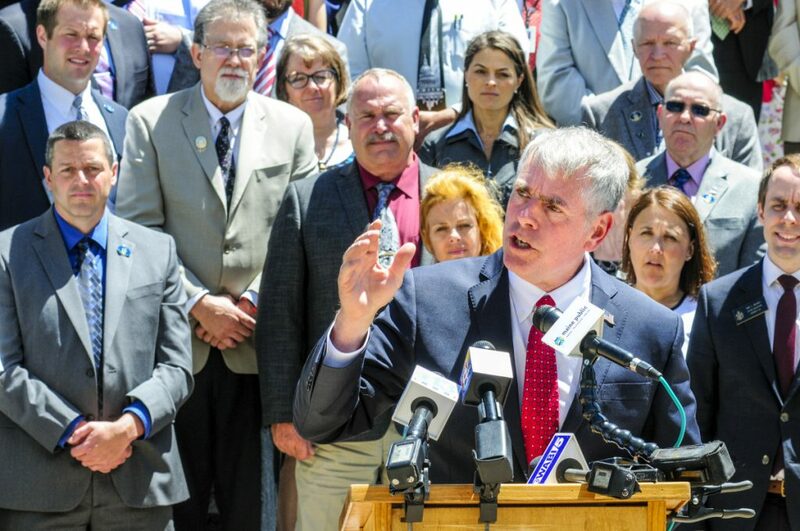 AUGUSTA – Republican state lawmakers and former candidates for governor rallied at the State House on Tuesday in support of Shawn Moody, the party’s pick to be its candidate in the 2018 governor’s race. With Maine Democrats still awaiting the results of their primary race as ballots were being counted and retabulated in Maine’s first statewide ranked-choice election, Moody told supporters he intended to carry on the legacy and policies of outgoing Republican Gov. Paul LePage. The auto-body entrepreneur from Gorham won 56 percent of the vote June 12, easily defeating three rivals for the nomination. Moody also responded to a question about the Trump administration’s controversial policy of separating immigrant children from their parents at the southern U.S. border, defending the president’s efforts to secure the border and saying he supports having a deterrent. All three of Moody’s primary challengers – Senate Majority Leader Garrett Mason, R-Lisbon, House Minority Leader Ken Fredette, R-Newport, and former Maine Department of Health and Human Services Commissioner Mary Mayhew – said they were solidly behind Moody. State Senate President Mike Thibodeau, R-Winterport, who left the race before the primary election, also spoke in support of Moody. LePage attended the event, too, although he did not address the crowd of supporters, including dozens of Republican state lawmakers. Moody, a relative newcomer to the Republican party who ran as an independent for governor against LePage in 2010, also praised Republicans in the Legislature for backing LePage’s policies and urged the faithful to work to elect Republicans to the Legislature. Moody joined the Republican Party in October 2017, just weeks before he announced he would be running for governor. Moody said he didn’t have a preference about which Democratic candidate he might face in November and wasn’t trying to calculate who the winner will be, or which one would be the easiest to defeat. Moody said as governor he would use all the tools and resources at his disposal to help people get ahead. When asked to comment on the current Trump administration policy of separating immigrant children from their parents at the southern border, Moody said some of the tactics being used were symbolic. He said one of the reason the U.S. had such border security issues was that politicians had ignored the problem for far too long.